In his reworking of Sean Ellis’s award winning social drama Metro Manila, Hansal Mehta moves the story from the slum areas of Manila to the seedy streets of Mumbai. It’s a tale of grinding, remorseless poverty and the desperation such hardship brings, but there are some lighter moments too and the film morphs into a crime drama about half way through. 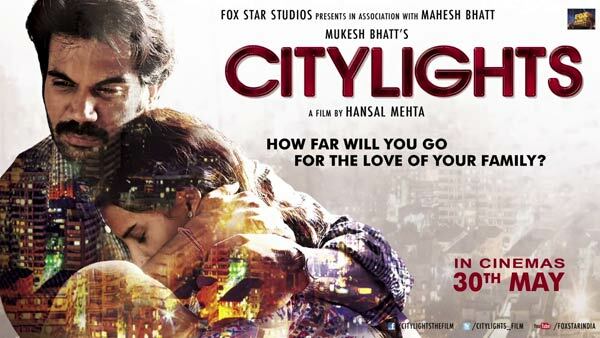 City Lights is perhaps not quite as effective as the original in telling the story of a young naïve family and their move from the country to the city in search of a better life, but what the story has lost in adaptation is more than made up by the strong performances from the lead actors Rajkummar Rao, Patralekha and Manav Kaul. The story opens in Rajasthan where Deepak Singh (Rajkummar Rao) has a clothing shop in a small town that he is forced to close when he cannot afford to pay off his debts. Since there appears to be no hope for any work in his village, he sets off for Mumbai with his wife Rakhi (Patralekha) and small daughter Mahi. Rakhi is reluctant to move, once in the city she seems less naïve than Deepak so perhaps she is well aware of the difficulties of trying to live in Mumbai, but ultimately she has no say in the decision. These first few scenes are full of light and laughter, and in just a few brief moments Hansal Mehta paints a picture of a happy family where there is a lot of love and hope that better days will come. Deepak plans to meet a friend from his army days in Mumbai, but when Omkar fails to turn up at the railway station the family has to find their way in the big city alone. After being swindled out of what meagre funds they have, a chance meeting with a bar dancer leads them to a temporary refuge in a half constructed building. While Deepak spends his days trying to find any kind of a job anywhere, Rakhi manages to get employment as a dancer in a bar. However this is not work she finds easy to reconcile with her conscience and she continually struggles with the leers of the men and their attempts to get more from her than she is willing to give. Deepak too is not happy about his wife’s job either, but the family is in such desperate straits that he has no other option but to let Rakhi work. Both actors do a fantastic job here of getting the depth of their emotions across using facial expressions with excellent body language and minimal dialogue. Although their situation seems unlikely to improve, the couple never give up hope, even if it’s a very compliant and resigned kind of hope. There are no impassioned speeches or battles against authority here, but rather calm acceptance of their place in society and the belief if they just keep trying then eventually God will provide a solution for them. It’s frustrating viewing at times when Deepak is unable to push himself forward when looking for work and Rakhi cannot put aside her inhibitions to make more money when she is dancing, but they are simple everyday people and Hansal Mehta portrays them just the way they are. No more, and no less. Their blind faith appears to work and things start to look up when Deepak gets a job as the driver for a security firm. The money seems good, and Deepak’s new partner Vishnu (Manav Kaul) even offers the family a place to stay. However Deepak comes to realise that his new partner had an ulterior motive for recommending him, and it is Deepak’s innocence and naiveté that got him the job rather than his previous army experience. Vishnu has a plan which needs the co-operation of his partner, and he’s been waiting for an innocent like Deepak to manipulate into following his commands. Deepak is reluctant, but when Rakhi loses her job in the bar it seems as if he has no other option but to go ahead with Vishnu’s plan if he wants to make sure his family survives. Rajkummar Rao and Patralekha both suit the role of poor immigrants to the city. They both look skinny and malnourished with beaten down postures and downcast eyes, and both achieve that calm acceptance that extreme poverty seems to bring. It’s only with each other that they seem able to look straight ahead and even then Rakhi rarely looks her husband in the eyes. Both exude innocence effortlessly, even in the rather ham-handed treatment of their love scenes, and Rajkummar Rao in particular never puts a foot wrong. Manav Kaul is also excellent in a role that gives him plenty of opportunity to develop his character. He’s the man who knows the ways of the city, and is patently more sophisticated and knowledgeable than his partner from the country. He has a wife and a mistress, but despite his city veneer he also deeply resents the people whose money he delivers every day and despises his own circumstances. In his way, Vishnu is just as desperate and defined by his poverty, even if it’s not as extreme as that experienced by Deepak and Rakhi, and Manav Kaul does an excellent job with the characterisation. The film does have a couple of songs which are either used over montages of the couple’s life in the city, or to highlight certain moments in their lives. The problem is that the music and lyrics are overly dramatic, particularly in scenes where the actors have already displayed plenty of genuine emotion and the music ends up detracting from rather than enhancing their performances. The track below which plays over Rakhi’s dancing and Deepak’s drinking in a bar does work better, but most of the other songs are too loud and intrusive to suit the action. The film is also very dark at times; to the point where it is difficult to see what is happening let alone the actors expressions, while the final climax seems rushed and too contrived compared to the rest of the story. These small issues aside, the film is an insightful look at the dark side of Mumbai and the realities of living in unrelenting poverty as Hansal Mehta successfully translates Sean Ellis’s story from the Philippines to Indian soil. Rajkummar Rao is definitely the standout as he once again completely immerses himself in his character and delivers an amazingly realistic and believable performance as he did in Shahid. Manav Kaul and newcomer Patralekha are also impressive in a film that raises questions about morality, ethics and poverty even if it does turn a tad Bollywood at the end. 3½ stars. This entry was posted in Hindi and tagged CityLights, Hansal Mehta, Hindi, Manav Kaul, Patralekha, Rajkummar Rao, Ritesh Shah, Sean Ellis. Bookmark the permalink. Apparently you get the cold white stuff up North this time of year 😀 One of the reasons I moved down under! Yup! It’s slowly getting colder here in Dallas but it doesn’t look like any snow will show up soon 🙂 What’s the temperature like in Australia?